Spider-People of all colors, shapes and sizes. Anyone can be Spider-Man under the mask. In Spider-Man: Into the Spider-Verse, not only does it feature the first big-screen incarnation of an Afro-Latino Spider-Man: it also features a middle-aged Spider-Man, a Spider-Woman, a Japanese Spider-Girl, Spider-Nicolas Cage, and even a Spider-Pig. PETA had to appreciate the representation on that last one, although I’m not sure how they felt watching the Spider-Pig eating a hot dog. Like the rest of the Spider-Man movies, Spider-Man: Into the Spider-Verse features Peter Parker (Chris Pine) in the titular role. Unlike the previous movies, however, Parker is not the main star here – and he isn’t the only Spider-Man. In Into The Spider-Verse, Miles Morales (Shameik Moore) is bitten by a radioactive spider and gets spider-powers all his own. While looking for the original Spider-Man to help him get acquainted with his newfound abilities, Miles stumbles upon the witty wall-crawler fighting the Green Goblin (Jorma Taccone) and the Kingpin (Liev Schreiber). In the middle of their fight, the Kingpin’s particle accelerator – a machine that can access alternate dimensions – goes off, killing Peter and splintering five different Spider-Person’s realities into Miles’ dimension. There’s an older, chubbier Peter Parker (Jake Johnson) who is going through a mid-life crisis, there’s the rebellious rock star drummer Spider-Woman (Hailee Steinfeld), a private-eye detective from 1930’s New York (Nicolas Cage), a Japanese school girl with her own robotic Spider-suit (Kimiko Glenn), and a spider who was bitten by a radioactive pig to become Spider-Ham (John Mulaney). All of these Spider-People must help Miles realize his true potential to become the Spider-Man that he needs to be. Because if they can’t help him, he can’t get them home – and then all of their realities will be lost forever. One of the immediate things you notice about this movie is its animation style. I’ll admit I was hesitant when I first heard about this project. Superheroes are not known for being very prominent in the animation genre outside of The Incredibles or Big Hero 6. In the case of a blockbuster name as big as Spider-Man, who has found massive live-action success with the likes of Spider-Man 2 and Homecoming, an animated movie felt like it was short-changing the character’s potential. It would be like hearing Warner Bros. announce that the Justice League sequel was going to be animated. You would, very reasonably, wonder A) Why this is happening, and B) How does this do the characters justice? Any doubt over Into the Spider-Verse, however, was immediately dashed when I saw the first few frames of this gorgeous animated superhero epic. One of the first things you recognize about this movie is how it mimics the old pop-art design of 1990’s comic books. The entire film feels and breathes of comic book euphoria, with the cell-shaded colors popping out of the screen as if it was from a comic book panel, character monologues appearing in caption boxes above their heads, and actions flashing in those “BAM!”, “SMACK!”, and “POW!” bubbles harkening back to Adam West’s days as Batman. I was surprised to find that in the movie’s more exciting moments, the action was so quick-paced and enthralling that I felt like I was watching one of the live-action Spider-Man movies. But even in the slower moments, the art was eye-catching, colorful, and beautiful to look at. This is one of the few movies where the animation not only works well for this type of story: it actually benefits it even more so than if it were in live-action. And the voice talent here is simply incredible. Johnson and Cage are reliable in the two main versions of Peter Parker (no surprise there). I personally found myself more impressed by the younger names involved with this production. Steinfeld, who has been picking up speed lately in big projects including Bumblebee, Pitch Perfect 3, and The Edge of Seventeen, really puts her own spin on Spider-Woman, playing equal parts sassy, spunky, yet affectionate in cinema’s first female Spider-Man. John Mulaney was pitch-perfect casting for Spider-Ham, and he gave the movie some much-needed comedy without ever feeling corny or ham-fisted (snort). And Moore outshines everybody as Miles Morales, a kid who is growing into his own but doesn’t know how to stand out from a long line of spectacular Spider-People. His story of not fitting in and trying to find his place in this already packed world is one every kid can relate to – especially in a genre as overstuffed and overpacked as the superhero genre. All of this is to say that the beautiful animation, the spectacular fight sequences, and the voice acting would have all gone to waste if the story was lacking. Luckily, the story is the strongest aspect of Into the Spider-Verse. Phil Lord, who is most known for 21 Jump Street and Lego Movie fame, wrote the film and co-produced it with his collaborator Chris Miller, and he brings a maturity and poignancy to Miles’ story that you wouldn’t expect in a movie like this. After all, this is an animated superhero movie. It would have been easy enough for Lord to write in a bunch of action sequences, take a paycheck, and call it a day. That’s not what happened though. The people involved with Spider-Verse cares very deeply about Spider-Man. And when I say ‘Spider-Man,’ I don’t just mean Peter Parker. I also mean Miles Morales, Gwen Stacy, Peni Parker, Peter Porker, and all the other Spider-Men after that. All of them are quirky, weird, off-the-cuff, nimble, and have witty one-liners for days. But they all carry that same burden of power and responsibility with them. All of them are Spider-Man. I loved Spider-Man: Into the Spider-Verse. 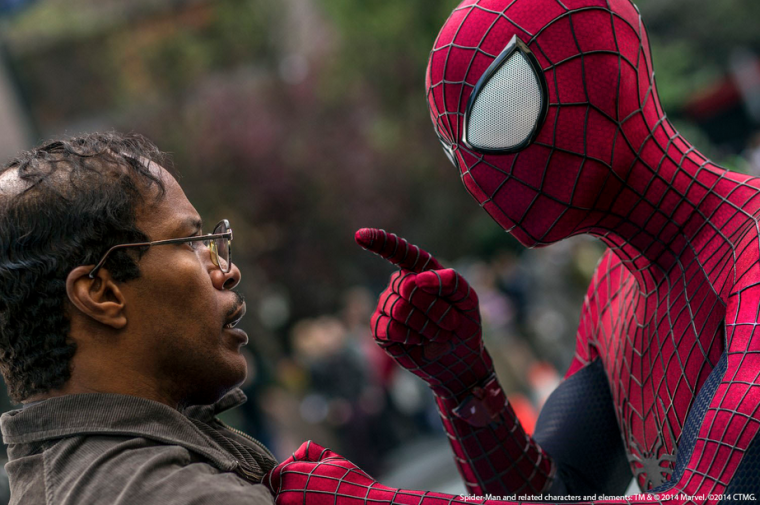 Not only is it one of the stronger Spider-Man films out there – it is also one of the best Marvel films to date and one of the best films of the year, period. If I had any criticism, it would be that some of the plot holes in the movie are a little too noticeable to ignore (like how the particle accelerator can link Peter Parker to Gwen Stacy even though they have different strands of DNA). But these are minor complaints in an otherwise brilliant movie. For nearly 20 years, we have been getting the same Spider-Man with the same alter-ego, same origin story, same costume, same villains, and same expectations. Spider-Man: Into the Spider-Verse opens the door to new possibilities and celebrates the differences that make each of us our own unique superhero. The Amazing Spider-Man 2 is the standard of a superhero movie that everyone should aspire to. It’s exciting, action-packed, gut-bustlingly hilarious and emotionally involving to a point where I was surprised at how personal and genuine it really was. “Amazing,” in fact, is not a good enough word to describe this movie — “Superior” is more like it. Taking place after Curt Connors, aka The Lizard, attacked New York City, The Amazing Spider-Man 2 shows Peter Parker (Andrew Garfield) as he continues to adapt to his new life as the spectacular Spider-Man. He’s just about to graduate, he’s getting a job as a freelance photographer at the Daily Bugle and his relationship with Gwen Stacy (Emma Stone) is going strong. Being Spider-Man has its perks and its downfalls, and this is a rare high point in Peter’s life. Elsewhere, however, dark forces develop under Oscorp. Engineer Max Dillon (Jamie Foxx) gets electrocuted by bio-electric eels, transforming him into the chaotic villain known as Electro. Russian mobster Aleksei Sytsevich (Paul Giamatti) gets equipped with a fully armed mechanical suit, becoming the Rhino. And Harry Osborn (Dane DeHaan), an old friend of Peter’s, returns with a dark secret that he’s hiding from everyone. That makes three villains in total for this sequel. Concerned? You should be. The last time we had three villains in a Spider-Man movie, that film was Spider-Man 3. I’m never going to get that image of Tobey Maguire doing the Elvis Presley-stride out of my head, ever. Does anyone have any hydrochloric acid I can pour into my eyes? Well, you can rest easy, fellow web heads. The Amazing Spider-Man 2 is not Spider-Man 3. Quite the contrary, actually. This is a significantly better Spider-Man than its predecessor, a film that bounces in between multiple tones and genres all at once and does all of them brilliantly. An early fight scene in the film, for instance, is as wacky and funny as a Looney Tunes cartoon, with Spidey struggling to grab all these plutonium canisters off of a moving truck like he’s in the middle of a pinball table. In another scene, he’s in the middle of an action sequence so exhilarating and mind-blowing that it could have come straight from a video game cut scene. In another moment, him and Gwen are dealing with a real emotional struggle neither quite know how to handle, something that has haunted Peter since the first movie. That’s what makes this Spider-Man better from the other one: It has many tones, story lines, characters and emotions that it’s juggling all at once. That’s a weighty order, and not one to handle easily. Yet director Marc Webb handles the challenge excellently, delivering just as relevant a character drama as he does an exciting action movie. The cast members have expert chemistry with each other, but that should be expected because of their exceptional performances in the first film. We already expect Garfield and Stone to be perfect with each other because they were nearly inseparable in the first round of the series. It’s more efficient, then, to focus on the newer cast members: Jamie Foxx and Dane DeHaan. Foxx is electric as the high-voltage villain, pun intended. At first he’s just a socially silly and awkward scientist, similar to Jim Carrey’s version of the Riddler in Batman Forever. When he goes through his transformation into Electro, however, everything changes. He becomes an angry and malicious supervillain, a man who is mad and frustrated at everything and just wants to kill everyone, then jump start their heart just so he can kill them again. DeHaan, especially, was desperate and conniving as Harry Osborn, a menacing and starkly different Harry than the James Franco version we are used to in the original trilogy. Both of these villains serve a pivotal role to Peter’s development. Electro is the physical conflict Peter has to face in the movie; Harry is the emotional one. There’s another concern comic book fans will have about this movie, and that is the same concern they have with Captain America: The Winter Soldier: We’ve already read the comics. We already know the twists that are coming up, and as a result, our reaction is dulled when that moment comes in the movie. Let me make a reassuring statement for my fellow comic book lovers: I could see the twist in this movie come from a mile away. Yet when I saw it, I reacted as if I was witnessing Peter’s tragic story for the first time. There are apparent concerns to have with this movie. The multiple story strands are worrisome, the overload of villains can be an issue and Max Dillion’s character is far too silly to fully accept as being realistic. Does that change The Amazing Spider-Man 2’s influence, or for that matter, its effect on the audience? The answer is no, it does not. The Amazing Spider-Man 2 is still a great sequel, an excellent expansion to the Spider-Man universe and a more-than-welcome development to Peter’s never-ending growth as Spider-Man. I’m tempted to compare it to the legendary Spider-Man 2, although I’m not sure if it’s quite there yet. One thing is for sure, however: it’s head-over-heels over Spider-Man 3. If Webb keeps this up, he just might surpass Sam Raimi’s original trilogy.